When your computer can’t boot, the way you may use to boot a computer is using bootable CD or Bootable USB flash drive, which may be Linux micro-system or Windows PE micro system, but if you have to install system in too many computers, and coincidentally, if there is no USB flash drive or CD to let you make a bootable media, how to be easy to achieve the goal? In this case, PXE Boot Tool will do a great help. PXE is the short for “Preboot Execute Environment”. Basicaly PXE boot enables you to boot multiple computers in the same LAN via network at the same time. 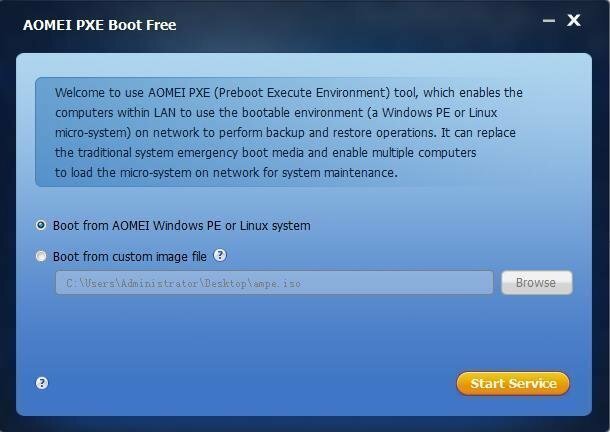 Here we will introduce a free PXE Boot tool, AOMEI PXE Boot, which is designed for solving the problem that boots many computers from micro system in network. Broadly speaking, you can create a micro system with a third party tool. Also, you can do a bootable Linux image or Windows PE image file with the tool offered by AOMEI Backupper. You can use AOMEI PXE Boot Tool and make other clients or target computers boot from these micro system. After booting, you can backup, restore or maintain system with tools offered with Windows PE micro system. Download and install it on the master/server computer. Once run the program, you’ll see this screen. All you need to do is select the proper boot media. You can choose either AOMEI Windows PE or Linux system or your custom image file. Once you selecting an appropriate option, hit the ‘Start Service’ button and you’re done. After starting the service, you will be able to see the devices that are connected to the PXE Boot Service. This freeware supports all Windows applications and operating systems, may they be up-to-date or old-fashioned. This software tool can work on Windows 10, 8, 8.1, 7, Vista and even XP. It’s nice, right? For instance, you can PXE Boot Windows 7 easily with this free tool, it’s really awesome. Function enhanced: built-in a DHCP server. Add a new function to set a bootable WIM file as a image file. If you set a WIM file as the image file, it can support UEFI boot mode. PXE Boot Tool can be one of the ways to maintain computer. It has proved to be a pretty easy and handy tool to boot multiple computers from the network. In a word, it is a great assistance if you are an administrator who in charge of numbers of computer within LAN. With AOMEI PXE Boot, maintain them will become much easier.